Can animals Climb Up the Toilet? I’ve seen many of those stories too. And nothing can be more frightening than the thought of meeting something scary, and possibly even poisonous when you’re half asleep. That depends on a variety of things. First of all, if you believe the news stories or see the YouTube videos designed to leave you shaking in your boots, they will tell you that that venomous snakes the size of a man can come creeping out of the hole and be waiting to pounce on you. No matter where in the world this legend comes from, it can’t happen quite the way they push it for a variety of reasons. First of all, in order to come up through your toilet, they would have to spend a great deal of time in water. And if they aren’t water snakes, they would drown before they reached your toilet. If a snake did by chance swim through the pipes and up into a residential toilet, it would be a water snake, and therefore not the huge deadly reptile you see in news reports. 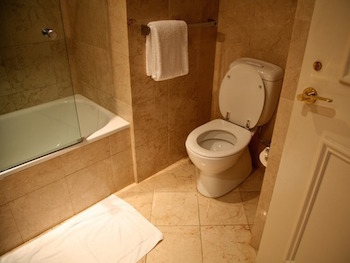 An animal with the best possibility of making it to your toilet would be the common rat. Rats are notorious for being able to survive a variety of conditions. They live in sewers, constantly on the hunt for food. As you wash food down the kitchen sink and it continues through the water main and into the sewer system, if a rat catches the scent, he could make his way back up through the pipes. Then once he was lost in the plumbing system, he could easily take a wrong turn and come up through the toilet. However, keep in mind that these incidents are rare, not the norm. That’s why they make the news. Squirrels can also occasionally end up in your toilet; however they won’t move through your plumbing. Instead, a squirrel will make its way into the stack vent on your roof, climb down the pipe and see light shining through the toilet’s passageway, then get trapped by the toilet lid. They won’t go back down because its dark, and will remain enclosed in the bowl until you open the lid. Overall, there is very little chance you will find any of these creatures in your toilet bowl any time soon. Instead of being nervous as you make your way to the bathroom in the middle of the night, take these tales for what they are: entertainment.